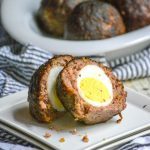 A delicious breakfast treat, this twist on a traditional Scotch egg adds an extra layer of flavor from sweet smokiness, without extra fat from frying. In a large mixing bowl, add the seasoned sausage, bread crumbs, rub, pepper. garlic powder, and cayenne pepper. Knead all of the ingredients together untul completely incorporated. Divide the sausage into equal portions, depending on how man eggs you're using. Flatten them onto wax paper into thin circular shapes. Place an egg on top and then wrap the sausage mixture around, to coat, and sealing any seams. Transfer the eggs to a disposable aluminum baking tray, and chill for 30-60 minutes. Smoke the eggs at 250 degrees for an hour and fifteen minutes.